Monday January 28 1907 It was a cold day. I did not attempt to wash. I had churning in the forenoon and worked all the afternoon fixing mittens for Will. I wrote a long letter to Alma in the evening. 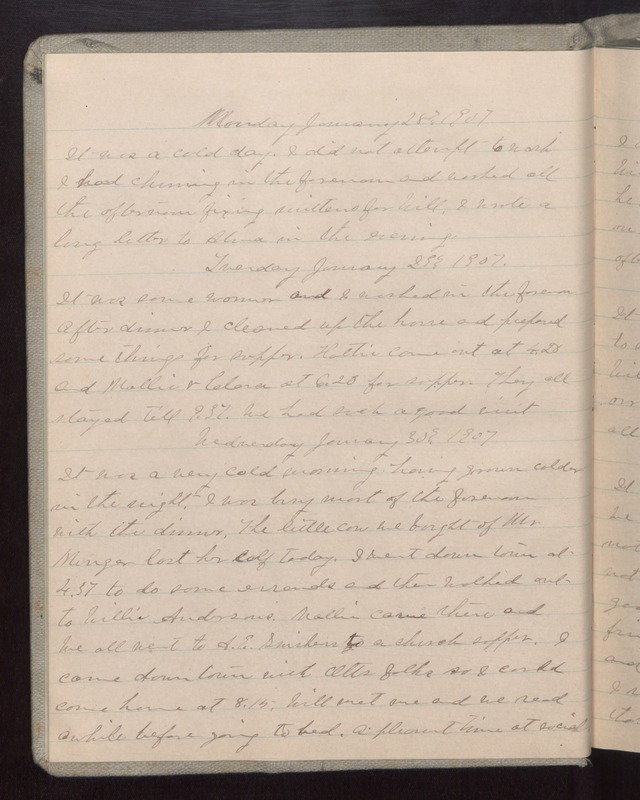 Tuesday January 29 1907 It was some warmer and I washed in the forenoon. After dinner I cleaned up the house and prepared some thing for supper. Hattie cam out at 4.20 and Mollie & Clara at 6.20 for supper. They all stayed till 9.37. We had such a good visit Wednesday January 30 1907 It was a very cold morning having grown colder in the night. I was busy most of the forenoon with the dinner. The little cow we bought of Mr Minger lost her calf today. I went down town at 4.37 to do some errands and then walked out to Willis Andersons. Mollie came there and we all went to A.E. Swishers to a church supper. I came down town with Otts folks so I could come home at 8.15. Will met me and we read awhile before going to bed. A pleasant time at social.